We accomplished our dream goal of winning the NASA national championship in SU and now the SCCA Runoffs national championship in P1 with the same car in the same year. The Runoffs battle was hard fought and included a whole cast of racers vying to beat us and prove Sports Car magazine wrong in picking us to win. The initial main challenger was (as predicted), Todd Slusher, who raced me hard earlier this year at the Sonoma Majors race. In the very first qualifying session, Todd and I ran the three fastest laps of the entire event with only 54/1000’s of a second between us on our best lap—1:27.714 vs. 1:27.768, respectively—but I had another one at 1:27.902 which turned out to be a telling sign as our consistency in running hot laps was better than the competition come race day. As it turned out neither of us nor anyone else would ever duplicate these times again in Q2 or Q3 as the track was extra special that Tuesday morning in Q1. So Todd was on pole with me lined up next to him in 2nd for the race start. See my fastest two laps in Q1 here. Sunday morning on race day turned out to be the coolest (about 50 degrees) and most overcast day of the week and the track was stone cold exiting the grid. Immediately, I could tell getting heat into the tires to achieve ultimate grip would take some time. I scrubbed the tires aggressively on the out lap and did about 20 burnouts trying to get the tires to come in as best I could. Check it out here. The race start was clean and I got shuffled back to 4th as tire choices came very much into play. Some tires respond better than others to cold conditions and come up to full grip quicker but then may fall off near the end. Our Avon tires take longer to reach their optimum grip but then retain that peak ability better than other brands. Still, I didn’t quite plan on being 4th, but then suddenly at the start of lap 2, Todd Slusher lost control and spun immediately ahead of me. Fortunately, we missed hitting him but lost almost 4 more seconds to the new leader, Perry Richardson, due to having to slow way down. But first we had to chase down the 2nd place car driven by Parker Nicklin. Check out the wheel-to-wheel action for 2nd here. After clearing Parker, Jason told me on the radio the leader had an 8 second lead and I just needed to dig deep and go for it. Immediately, we started closing on the leader at about 1 second per lap and after several laps the leader finally came back into our view after initially being so far ahead I couldn’t even see him. Once you can see the other car, it makes it a whole lot easier to continue to make up ground. Finally on lap 18, with just 2 more laps to go, I caught and passed Perry and then hung on for the win. See the winning pass here. 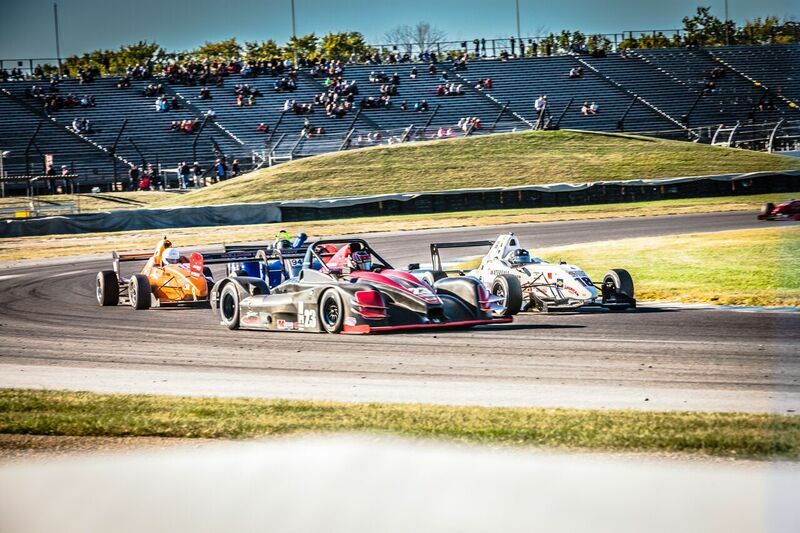 This victory was made all the sweeter after dominating all the sessions at the Indy Runoffs last year but failing to win the race and then getting penalized for our fast times with a loss of horsepower and added weight to try and slow us down this year. To win at our home track in front of friends, family, and Team Cranbrook folks was really special. Having to come back from 4th to 1st under green flag conditions felt like total vindication that we could really perform under pressure when the national championship was on the line. By most accounts, the P1 race was the best one of the entire event. We also competed at the Runoffs in FE2. We qualified 5th and ended up finishing 6th after running most of the race in 4th. I had a really good battle with Paul Schneider that he eventually won by overtaking me for 4th. In my effort to try and get back around Paul after he passed me, I spun and lost another place. Next year, this spec car gets a new tire to replace the miserable one we had to race on this year. Finally, I have to thank Jason Hohmann, owner of Bulldog Motorsport LLC, and Chris Garcia, his lead mechanic, for preparing both of my cars in such magnificent fashion. Bulldog has gained quite the reputation for having its cars be reliable and at the front of the pack. My stable mate, Tim Day Jr., also won the P2 title in a Bulldog prepared car. This is truly a team sport and Bulldog’s meticulous efforts play a BIG part in our successes. Quite a feeling seeing that on the score board. The racing season is winding down and that means the national championship races are on the line with two different sanctioning bodies. For the first time ever, we elected to compete in the Super Unlimited class at the National Auto Sport Association (NASA) national championship races. This year’s event was held in Austin Texas at the Circuit of the Americas (COTA) on the Formula One track. Super Unlimited (SU) means there really are no rules and you can run whatever you want. So it was a chance for us to run our Norma in her fully developed state without any artificial restrictions. There were several noteworthy competitors entered as well including the defending champions—Davidson Racing and their pro driver Brian Frisselle. Their race car is an older Norma with a very powerful BMW 6 cylinder engine making about 450 h.p. versus our 285 h.p. Their car was built specifically for SU. Jason actually had a lot of experience with this car as he crewed on it several times in the 25 hours of Thunderhill including the year it won the overall title. We knew the Davidson car would be faster in a straight line but felt we could make up for this with our superior braking and cornering speeds, so the stage was set for a good battle. The real battle, though, turned out to be among the mechanics. The Davidson car only turned one lap in the first qualifying session and then the motor blew up. We successfully ran both qualifying sessions, turning the fastest laps, and putting the car on pole. In the qualifying race on Saturday, we ran in a rain storm for almost 5 laps before coming in early due to the dangerous conditions (watch treacherous rain video here). Meanwhile, the Davidson car was still being worked on. In drying the car out from the rain storm, we found out the front oil seal had failed and needed replacement. Jason and his assistant Cody (Chris was back at the shop preparing cars), tore the car apart and 8 hours later it was back together and ready for the championship race on Sunday morning. Amazingly, the Davidson car finally made the grid and started only a few rows behind me. I was starting in 5th place after coming in early in the rain race. By the end of lap 1, the Davidson car was in 2nd and I was in 3rd and we had a double yellow caution period. After the pace car pulled back in, the race was on as both of us got around the 1st place car and we both set our fastest lap of the race on lap 8 in the 2:07 range and then the Davidson car just quit running on lap 9. And that was that. Officially, Jimmy Casey finished less than 2 seconds behind me in a Radical SR8 but we had plenty of speed in reserve if it was needed. Jason really won that race for me by giving me a car that ran flawlessly the whole time I was there. We both made winning that race a goal for the season—so mission accomplished. Check out the highlight video here. Now all attention goes to trying to make history and win the SCCA Runoffs in Prototype 1 (P1) and be the first team to ever win both sanctioning bodies national championships in the same year in their premier class. In addition, we are competing in Formula Enterprise 2.0 (FE2) for the first time at the Runoffs and hope to do well in that one too. Well we sure hope it's a preview as we swept the weekend by putting both cars on pole and winning all the races. We ran both the Norma in P1 and the formula enterprise car in FE2. This was the first time in about 7 years that I attempted to do the double...meaning driving two different race cars over the course of the weekend. With my arthritic neck always being a concern, the physical demands placed on it by all that seat time and high g forces made me a little nervous heading into the weekend. Fortunately, my neck held up well and we were able to run all the sessions. The Prototype 1 field had 11 entries including Todd Slusher who is looking like my strongest challenger. Todd and I have already had several good battles this year at Portland and most recently at Road America. This time I edged him out for pole position (see pole lap here) but it turned out to be moot as he got the jump on me at the start of both races. In race 1, Todd getting the lead early turned against him as he ended up hitting debris on the track that punctured his radiator. I was right behind him when it happened and watched bits and pieces of fiberglass and metal fly by. In race 2, we had an epic battle all race long with my margin of victory being less than 8/10ths of a second. Watch the full race video here. In FE2, my only competitor was Tom Burt so not sure how we'll stack up at the Runoffs when the fast young guns come to Sonoma. Nonetheless, I'm looking forward to the challenge. I turned 63 on May 23rd and so did Road America (RA) with the 63rd running of the June Sprints this past weekend. The Sprints are second only to the Runoffs in being the most prestigious event of the year. RA is a 4 mile super fast track with 3 long straights where you reach terminal velocity of +/- 150 mph on each section. Thus power and frontal area of the car are extremely relevant in just how fast you go. These are areas where my car is at a big disadvantage and really suffers now from all the penalty rule changes. I was routinely 5-10 mph down on all my main competitors in top speed. Many times I had a big run on them entering the straights and easily in their tow yet they could easily defend at the end. I learned this early on in the test day so my only strategy was to drive smart and wait patiently all week end long and qualify as high up as I could. Then hope for a mistake or opportunity to come my way through being consistent. The level of competition was the best of the year to date, a total of 10 cars, and 5 of them qualified within 1.5 seconds of the best pole time of 2:04.2. I was starting from the 3rd position and 7 tenths back at 2:04.9. My fastest lap came in Q2 although only a few hundredths faster than my best time in Q1.. That consistency bode well for the races. The quality of driving was pretty good by everyone so that we had no double yellow periods in any of our sessions. That's remarkable in itself. Because of that, I captured lots of good front facing video and have decided to post it all as a way for someone to actually be a passenger for the weekend...so to speak. Check out the various videos yourself. Qualifying always produces the fastest laps so if your looking for the best a man can do--check those videos out. Also, explore the intensity of the slow dance on the pace lap scrubbing tires. Then there's always the entertaining green flag start and opening laps of the race. Add the daring passes that become pivotal to the outcome and you have a lot of excitement. See them all (below) or watch a highlight reel here. Bottom line is we got a bit of a lucky win on Saturday when the leader broke a CV joint on the last lap and we were in second place and able to capitalize on the mechanical failure. On Sunday, we finished 3rd and under great pressure from the following car. The only unfortunate thing that happened was on Sunday we had a great three car battle going for the lead with me in second and lapped traffic ruined it with a competitor ignoring blue waving flags for over one lap that allowed the leader to get away. Otherwise, the quality of driving put on display by our run group was remarkably good. While we were at the event, it was announced that the 2020 Runoffs will be held at RA. We are definitely looking forward to that even though for now it appears we are running with too much handicap for that track. After 6 months of hand wringing and trying to figure out what to do since the infamous Club Racing Board (CRB) ruined our racing plans for the Norma and obsoleted our existing engines with a rule change unique to us, we finally made it back on track for the Portland Super Tour weekend. 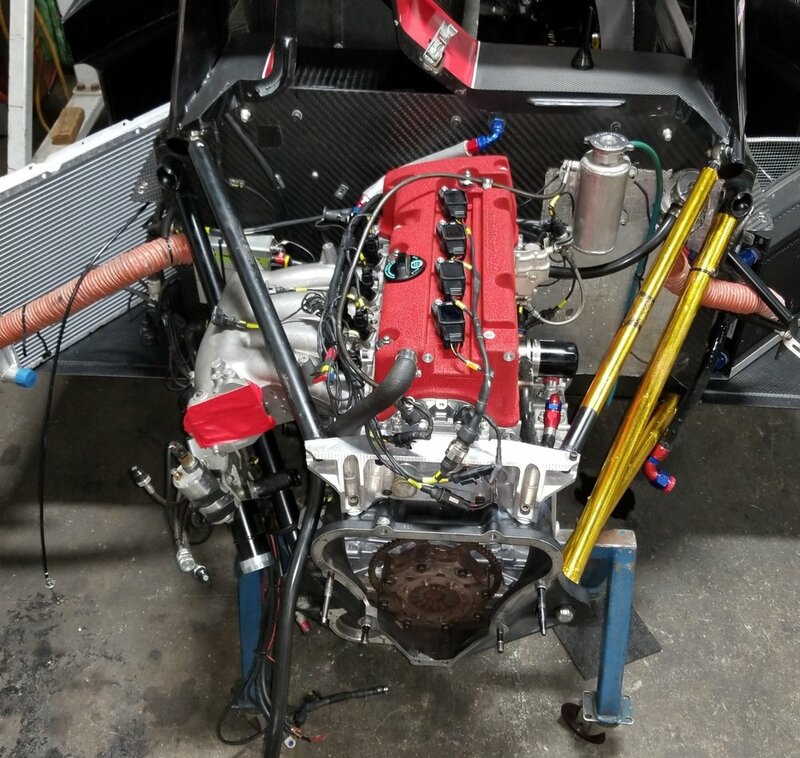 We now have to run with 50 more pounds of penalty weight and a dumbed down engine that when combined with the hit from last year is now 25-30 horsepower less than when we won the national championship in 2016. Despite this handicap (we were the slowest P1 car in a straight line), we won the Sunday feature race over 5 other P1 entries. Our run group had about 35 cars in it spread over 6 classes. Unfortunately, a big wreck caused the last half of the race to be run behind the pace car so it was not a very satisfying way to win. Nonetheless, we did have the fastest race lap on Sunday and showed good pace all weekend long. Our Q1 effort was just .047 seconds off pole at a 1.09:964. This time was 1.1 seconds slower than our best qualifying time last year so the CRB's balance of performance adjustment definitely affected us in a big way. In Saturday's race, I was having a good battle with the pole sitter, Todd Slusher, who races an Elan DP02 P1 car. Then on lap 14, my throttle stuck wide open at 140 mph going down the back straight away. Check out what happens next: here. A clamp broke and got caught up in the throttle linkage causing the issue. Prior to that we had a real good contest going on. I always say it just takes one other competitive car to make for a good race. See the battle: here. 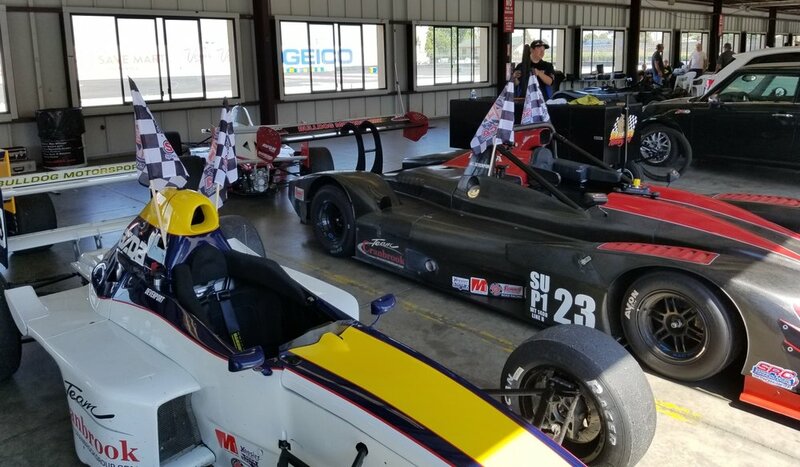 Last weekend, at Buttonwillow Raceway near Bakersfield, CA, the Formula Enterprise 2.0 race car made its debut on the west coast with two cars just being converted to the new specification motor the night before leaving for the track. I was driving one and Tom Burt was driving the other and these are only the 3rd and 4th conversions completed in the whole country. The brainchild behind this generation 2 effort, Mike Davies of SCCA Enterprises, came out to help sort things out and gather needed data to continue to refine the new engine ECU mapping. The new Mazda MZR 2.0 liter engine makes about 10% more horsepower than the engine it replaces and it is now about 185 hp. in total. This difference doesn't seem like much but it translated into about 2 to 3 seconds a lap faster than the old 2.3 liter motor. Plus it sounds great and revs higher and thus pulls far longer than the old one. In addition, we gained a new 'no lift' upshift capability that makes driving the car more fun. Next on the agenda is having an 'auto blipper' downshift mode that will really bring the car into the modern era and add to its drivability and fun quotient. New Year, New Rules Battle, What Else is New? Well the infamous Club Racing Board (CRB) acted swiftly and punishingly and changed the rules which effectively bans me from P1 competition unless I am willing to spend a lot of time and money to modify my Norma again. This is really getting old that every year starts off with a big rules battle. They are writing rules that only really affect me at the end of the day. I guess I should take it as the ultimate compliment that since our racing program has been so successful, other drivers think they have to get the rules changed to slow us down. In anticipation of being hassled again by the CRB, Jason and I have added some other race cars to the fleet and plan to run them as well this year. Our primary emphasis will be in running a Formula Enterprise (FE) which is an open wheel formula style race car. I raced one of these for several years back when I started. What's making it more compelling this year is that a big upgrade is in the works that swaps out both the transmission and engine and rebrands the car from FE to FE2. Jason and I are looking forward to the conversion and developing the FE2 into a very fun affordable (and rentable) race car to drive. In addition, a new race series has been created just for FE and FE2 and it is called GP4. 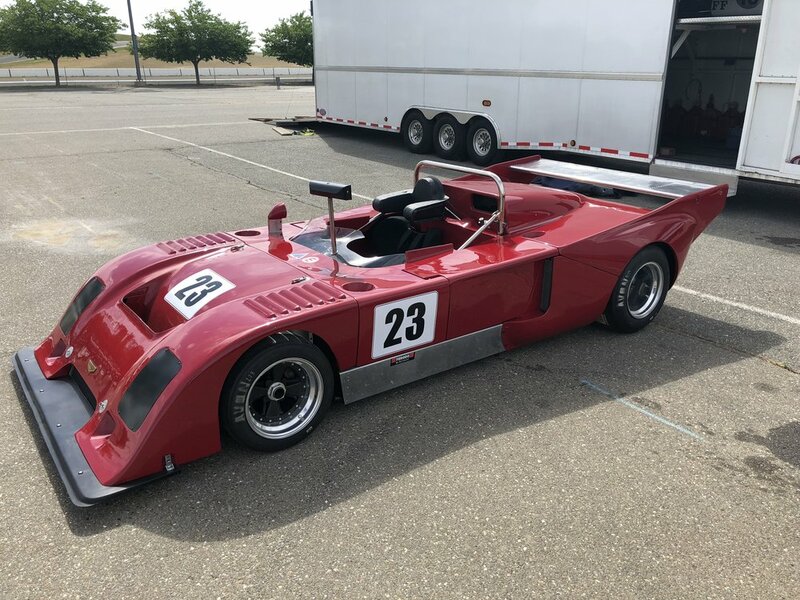 Another race car we plan to run is a vintage sports racer from 1976, a Chevron B36. It is a beautiful race car from the golden era and runs a 2 liter Hart 420R race engine. In essence, it is a 40 year old version of my Norma. This car will be raced in a few vintage events and, hopefully, the Monterey Historic Reunion event which is one of the best vintage events in the world. Jason and I have been busy getting the Chevron ready, including making a custom bead seat and head surround. This car was just freshly restored by the previous owner but we'll need to get it all sorted out and running just right. My ten day Indy Runoff's experience was filled with extraordinary highs and lows. Just soaking in the history of the place was pretty cool. Jason and Chris made the cross country trek in the Bulldog Motorsport caravan without incident and right out of the trailer we were immediately the fastest P1 car there and remained so throughout the entire event. Almost 1000 cars, an all-time Runoffs record, were entered this year and they were spread over 28 classes. Due to the large overall field, some classes were grouped together creating mixed class racing for the first time. A highlight of past Runoffs has always been getting your own run group so only your direct competitors were on-track with you in the key qualifying sessions and the race. My class, P1, was paired with the open wheeled formula 1000 aka FB cars. This proved problematic in the first day of testing when I was hit and knocked off track into the gravel trap by an FB competitor. Fortunately, my car was undamaged but it took two hours for the crew to get all the gravel out of the car. A feared repeat of this incident would later cost me the race. The condition of the track surface itself was unlike anything we had ever seen. It was super smooth and had lots of grip which allowed us to lower the car and create extra aero downforce and therefor faster cornering speeds. The higher g loads ultimately took their toll and after 4 years of no problems, my arthritic neck finally cried uncle and stiffened after 6 days. The last 4 days were spent trying to keep my neck from totally locking up on me and preventing me from making the race...but yet still wanting to try for the elusive fastest lap of all. Pride goeth before...the fall. Proverbs 16:18. After setting a blistering time of 1:30.794 in Q2, the fastest time of the day out of the entire field of 1000 cars, we concentrated on trying to better that in O3 and Q4 to capture the overall fastest time with our only competition being two formula atlantic drivers running in FA. Ultimately, we were unable to improve on that time as we could never get any clean unimpeded laps in the final two sessions due to being paired with the FB's. In hindsight, I should have let my neck rest as my Q2 time easily put me on pole for the P1 class. In Q4, I ran flat out thinking my neck was feeling pretty good and about half way through the session, my neck popped and forced me to let my head rest, as best I could, against the head surround. I gutted it out and with adrenalin flowing soldiered on looking for the one clean lap. Finally, lap 12, the last lap, looked to be clean and off to a purple start but then I started to run out of gas and that was that. Jason makes me do my own fuel calcs so I take the blame for cutting it too close trying to keep the weight down. Needless to say, when I got out of the car and the adrenalin stopped flowing my neck hurt immediately and was really stiff and sore. I went ahead and enjoyed, as best I could, the pole award ceremonies that took place on the big podium. It was a real honor to get called out front and see all the past winners' names engraved on the back side of the podium. And, of course, I gave a big shout out to Bulldog. But privately, Jason and I felt just a bit disappointed that we couldn't really show our stuff. Then the unthinkable happened, our Norma was impounded and locked away, under a mechanical protest from a fellow P1 competitor asserting our car had non-conforming bodywork under the FIA CN rule book. This process then took on a life of its own. So I went to my room for the night pretty discouraged. Then Tracey, my wonderful wife, arrived and lifted my spirits, gave me joy, and love and maybe just as important this one time...left over medications from back spasms she had earlier this year. I took them, she kissed me good night, and I prayed for relief. And I knew others were praying too. Friday morning, I woke up feeling remarkably better and it was a day off from driving but I still had to deal with the protest. The SCCA has quite the formal process for dealing with a serious accusation like this. Statements are taken, multiple inspections are performed etc. etc. An actual deliberation is conducted and then, finally, a decision is rendered. So 24 hours after the protest was filed, it was thrown out and the car was released. However, we elected to keep it locked up as now we were uncertain as to what depths the competition might go to sabotage us. Race day was near perfect weather, sunny and a cool 70 degrees. I got my third acupuncture treatment and this time she cupped me too. I felt good and ready for the race ahead. Check out the full race video here. Tim Day Jr. comes around the outside from row 2 to take the lead into turn 1 at the start. I take the lead back by lap 3. For the first 10 laps everything went according to plan and I led after an early challenge from Tim Day Jr. Then on lap 11 entering turn 12, as I'm trying to lap the #18 FB car around the outside, the driver starts running wider and wider as we enter the brake zone and pinches me a little tight to the wall. My in-car video shows my eyes looking at him and trying to make sure he doesn't hit me. When I focus back forward, I've gone too deep and missed my braking point. Then I really make a mess of trying to get the car off the grass and running again by spinning and making multiple efforts at restarting the car. Finally, I get rolling again and the chase is on. I reel off some quick laps including the fastest lap of the race at a 1:31.499 on lap 14. Then entering turn 1 on lap 16, I catch and pass the 3rd place car and am back on the podium. I also catch the #18 FB car entering turn 6 and proceed to drive around it and then in turn 6a, the #49 losses control and starts spinning just as I'm passing it. Fortunately for me, I got around him on the outside and then the #49 gets t-boned by the #94. I complete lap 16 and double yellows are now out for the big wreck. As I catch the pace car near the end of lap 17, red flags are flying and all cars are stopped on track. Then they checker the race 3 laps early and with over 10 minutes left on the clock and it's all over. Disappointed, but at least feeling somewhat redeemed by fighting back to make the podium, we put on a game face and celebrate on the podium and go through the post race interviews and hours long tech process. Five cars entering turn 6 and then all hell breaks loose in 6a. I skillfully (ok maybe with some luck thrown in) navigate through it all. This is the podium celebration that never happened according to the final results that dropped me to 4th due to a strange quirk in the rules regarding a red flag race stoppage. The next morning I find out that we've been dropped back to 4th place in the official standings and I inquire and am told that due to the red flag situation they revert to the previously completed lap by the entire field. I know we almost completed 17 laps so it would seem lap 16 would be the one counted and I was clearly in 3rd already. Then it gets really weird in that timing and scoring say the red flag was caused not by the wreck but by the whole track communications system going down. And that normally they would not throw the red flag until they knew all cars still on the lead lap had crossed the start finish line so as to keep the race order intact. And that, in fact, the two slow cars still on the lead lap did cross start/finish completing lap 16, but the officials ruled they really should have stopped earlier. So alas, lap 15 was deemed the race finish and we were in 4th at that time just seconds from passing for 3rd. The final irony was that the official 3rd place car #94 was involved in the big wreck and would have been out of the race had the race been scored on lap 16 or later. The driver of the #49 car, who was hit by the #94, sustained a broken leg in the crash but was otherwise unhurt. Interestingly, he was the driver that protested my bodywork. My wife, Tracey, has a great saying, "anytime you finish the race unhurt and with your car intact, you've won." And you know, she's right. We got to go compete at the most storied race track in the world and almost pulled off the repeat. It just wasn't meant to be this year but what a story behind it all. We just finished a double race weekend at Laguna in the Norma. This was our first event running Norma since the June Sprints. We've been thinking about how best to compete at Indy given the horsepower loss imposed on us by the SCCA's rule's making committee, the infamous CRB. Jason and I decided to try something different in our car set-up this time. Normally you can count on reasonable weather conditions at Laguna with temperatures between 65 and 80 degrees. Not this time, temperatures were over 100 degrees on the first two days making grip levels on the super hot black pavement way lower than usual. So even though our set-up seemed to work well, you couldn't tell it by the stopwatch. Finally, on Sunday, the heat wave broke a little bit and temperatures came down about 10 degrees and some cloud cover kept the track from getting too hot. So we put on some better tires and went out to see just how well we could do in late morning qualifying. The car and grip levels were quite good and we broke our own track record by a few tenths getting down to 1:21.297. Then in the afternoon race, we ran flat out for 30 minutes and laid down 22 really good laps and crushed the field by lapping everyone at least once and many several times. We are going to roll out of the trailer at Indy with this set up and see how it works there. Hopefully, it's really good there too. Our race is on Saturday, September 30, at 4:45 pm eastern time (so 1:45 pm west coast time). It will be broadcast live at SCCA.COM so follow along and see if we can repeat. Not sure if this is a jinx or not, but Sports Car magazine predicted us to do so but posted an incorrect picture...oh well. Brand new floor going on Norma. 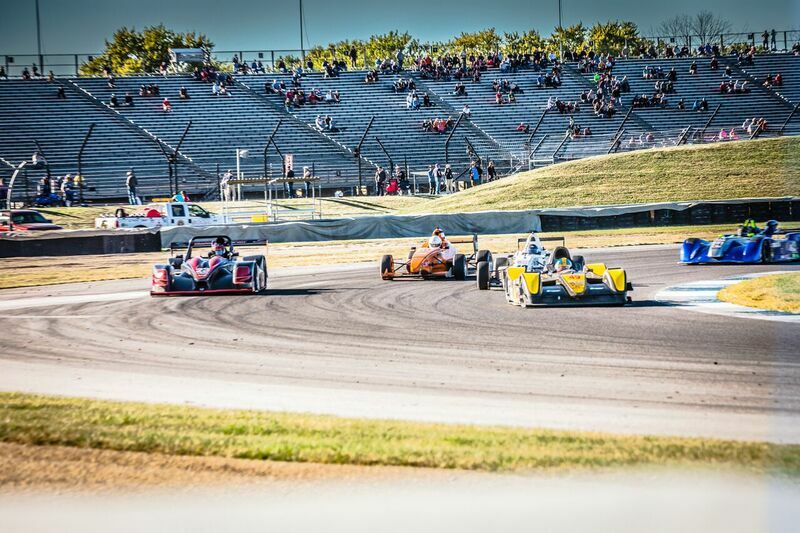 Final preparation underway for Indy Runoffs.